What we call internet is nothing more than a tightly woven web of advertisers monitoring your every move. From everything that you desire to everything that you fear, everything is out there on the internet. You hop on to Messenger and tell your friends that you are looking forward to Mortal Kombat 11. The next thing you notice is Amazon flooding your browser with ads which are beckoning you to pre-order the game every time you visit the website. You go on to Twitter, and you see ads that suggest you follow developers of Mortal Kombat 11 game. Yeah, this happened to me recently. It compelled me to re-think my privacy and how much Google knows about me? Google’s sole purpose is to “Organize all the information there is in the universe and make it universally accessible and useful.” This distills down to the fact that there is no monitoring of privacy. On the other hand, to compete with the search giant, there is DuckDuckGo. The search engine started promoting itself as a ‘fair search’ rival to Google. In addition to that, DuckDuckGo was endorsed by the NY Times, PCMag.com, and Search Engine Land as a direct threat to Google. Can you recall the instant answer feature on Google search? Everyone got crazy about it. However, the reality is that Google copied that feature from DuckDuckGo. Several other things set DuckDuckGo apart from Google. Firstly, DuckDuckGo doesn’t track your IP, not even your search history. Secondly, if you are searching for something, before showing the Wikipedia page, DuckDuckGo shows you the original websites where the facts are from. Furthermore, you can even search directly on YouTube, Amazon, and Facebook without visiting the sites. Want to see an eye-opening comparison between DuckDuckGo and Google? Afterall, how can a little resemblance hurt Google? I am betting that you never bothered to peruse through the long and confusing policies that Google lists down on their website. I won’t force you to labor through all of that, because even if you do read it, Google will never let you in on how much they know about you, and which data they are willing to share with organizations without the consent of users. The second biggest issue that annoys me a lot is the way Google search engine manipulates search results. 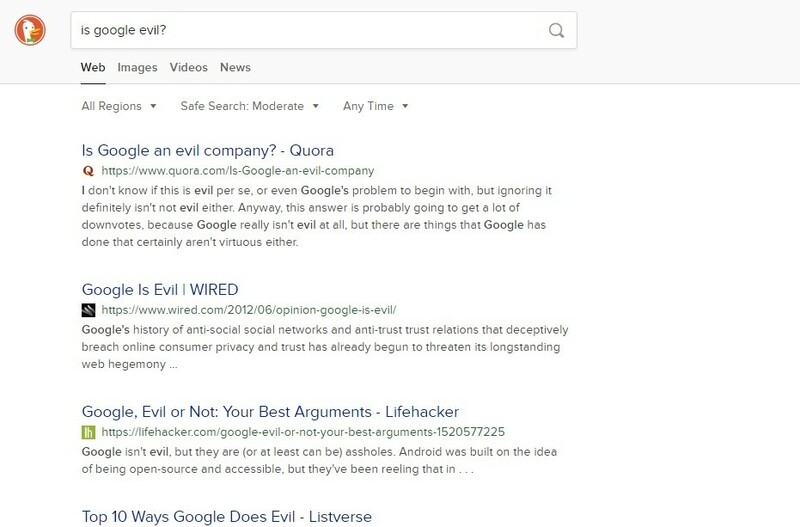 If you search ‘Is Google Evil?’ on Google, you’ll be presented with all the snippets that spurn Google. Touché! However, if you search the same query on DuckDuckGo, you’ll be presented with no-nonsense data; just useful results. Note how DuckDuckGo has organized the organic search results in an unbiased manner. 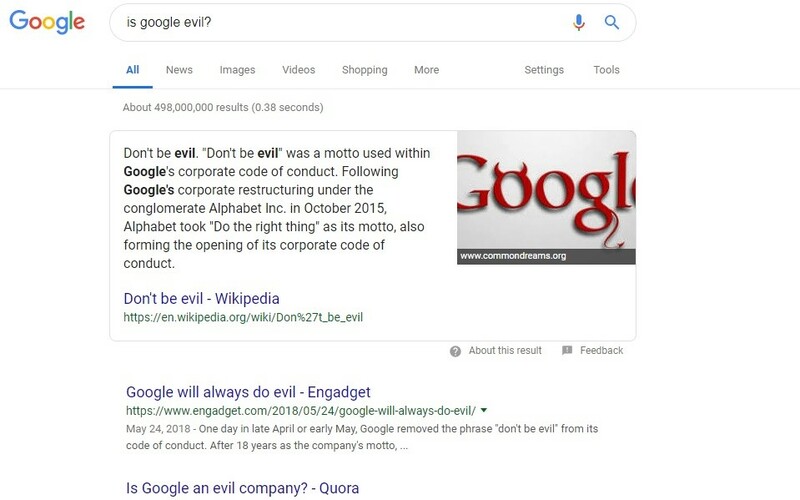 While with Google, all we can see is their snippet, their YouTube videos, and articles which label Google as Evil Genius. Bing and Google have different business models than DuckDuckGo. Google controls what people get to see. DuckDuckGo deals with this issue head-on. Want more traffic on your website? We can help you with that. When you click on any link on Bing or Google, the search terms are sent to the website that you are visiting in the HTTP referrer header. When you open a website, your IP address is shared to identify you. DuckDuckGo on the other hand, calls this “search leakage” and prevents it from happening to default search results. Instead, when you click a link on DuckDuckGo, it will redirect in such a manner that your search terms are not shared with any other sites. The websites may know that you’ve visited them, but they can never know what you searched for. The way search operates on Google and other popular search engines is by creating echo bubbles, which translates to the fact that you get to see whatever your friends are searching for and match your results with the queries of your friends. While it is okay to socialize with friends, it is not okay to influence your search results by what your friends are searching for. The echo chamber uses personalized results which are affected by the personal, political, and religious beliefs of the user. DuckDuckGo doesn’t do anything like that. DuckDuckGo doesn’t store a personal profile to influence the user. Instead, the crawler of DuckDuckGo displays results without any filters. Why should you trust DuckDuckGo? One of the strong points of this era is that people are smart. They can raise questions when something doesn’t feel right. This goes for tech companies as well. Previously it was Facebook; now Google is also coming under scrutiny on how much personal information is stored and shared by Google? There is an extensive list of corporations, governments, and even unethical gathering of personal data in the last couple of years. So, it is natural to question why you should trust DuckDuckGo in the first place. To start off, the founder’s core mission right from the beginning was to develop a clear and safe search engine. However, there are tons of other reasons to trust DuckDuckGo. DDG is developed by mixing free and open-source software. Most of the designs on the website, the mobile apps, browser extension, and even the instant answers are available on DuckDuckGo’s GitHub page. Although the primary search capability is kept secure, the other parts are kept open for the people to see. Just like various organizations, DuckDuckGo donates a portion of it’s earning to worthy causes. They only serve organizations which prove reliable and authentic. Each year, DDG selects a new group of charities via Reddit and by suggestions. To date, DuckDuckGo has donated around $1,300,000 to the beneficiaries. In January 2018, DuckDuckGo moved beyond search and developed tools which are destined to maintain your privacy over the internet. These include a browser extension, mobile apps which include protection of tracking, encrypting data and private search feature. The new update also added Site Privacy Grade which indicates the extent to which a website maintains your privacy — ranking from A through F.
The Internet Gatekeeper or an Opinion Builder? While DuckDuckGo is more of an accurate search engine, Google can be construed as an opinion builder. During the US elections when anyone searched for Hilary Clinton, Google deliberately hid and incriminated against any search results that went against Hilary Clinton, so much so that Google actually hid all the negative autocomplete results for Hilary Clinton! Another example is of Clinton foundation. 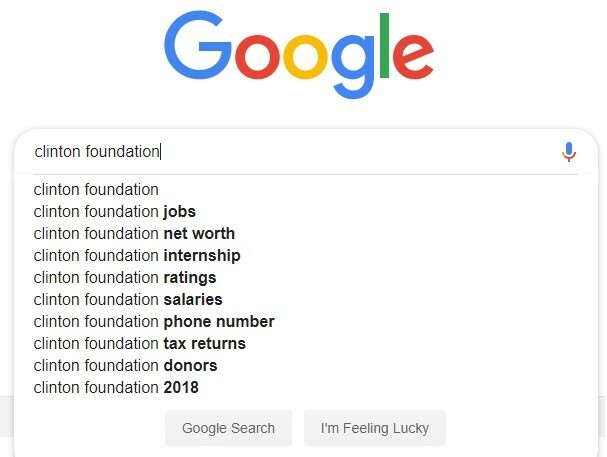 If you search Clinton foundation on Google, everything will look fine. Nothing out of the ordinary. However, if you search the same phrase on DuckDuckGo, you’ll see the difference. 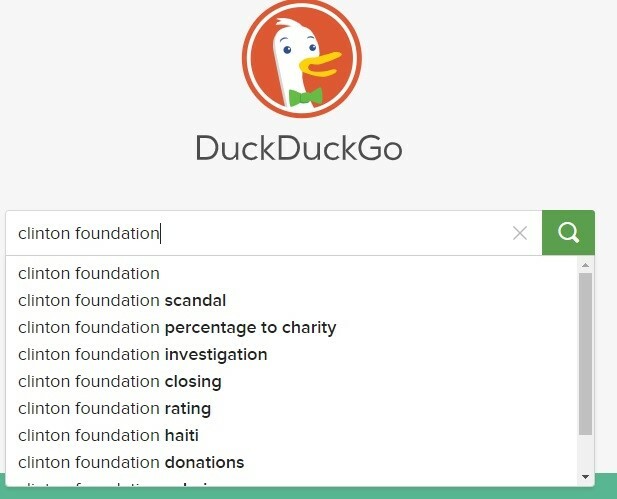 While Google is revealing nothing even remotely shady about the Clinton Foundation, DuckDuckGo is presenting results more transparently. The purpose of a search engine is to display all results. If the result is inclining towards more positive or negative, it means that the results are polluted. Google seems more opiniated while DuckDuckGo displays hard and straight facts. One way to kill the competition is to improve yourself; another way is to resort to unethical practices. If you search anything on Google, you’ll see Google reviews at the top. While on DuckDuckGo, Yelp reviews are displayed first. This gives a clear message that Google is promoting its services more than any other service. Search Engine or a Spy? While Google uses all your search data and history and sells it to advertisers, DuckDuckGo does nothing like that. It is up to you to disable the advertising on DuckDuckGo and bid adieu to pesky ads. While DuckDuckGo doesn’t earn from selling data, it earns from products that are related to search results. For instance, as mentioned earlier, if you have talked about Resident Evil with your friend, this doesn’t mean that you’re willing to buy the product. While on DuckDuckGo, you’ll only get related ads if you search with an intent of purchasing the game. I am not comfortable with a search engine gathering my data and selling it to third-party agencies. What I want is a safe search engine that provides me with relevant results and destroys my data as soon as I close the search engine. I have switched to DuckDuckGo, and if you want a safer, transparent browsing experience it is a good time to switch before things start to spiral out of proportion. This is a refreshing take from a Marketing Agency. Excellent article, if a little contradictory to your use of Google Analytics and Tag Manager.